Welcome: Vapid Lacquer:FLAKES and MORE!! Today I have 7 beautiful polishes from Vapid Lacquer to share with you.As you may have seen in the polish community, nail polish with flakes is the new thing.Believe me they are gorgeous!! I have many to show you today along with a linear holo. These polishes will be available for purchase January 30th. These shades will be going fast. Let's take a look below. 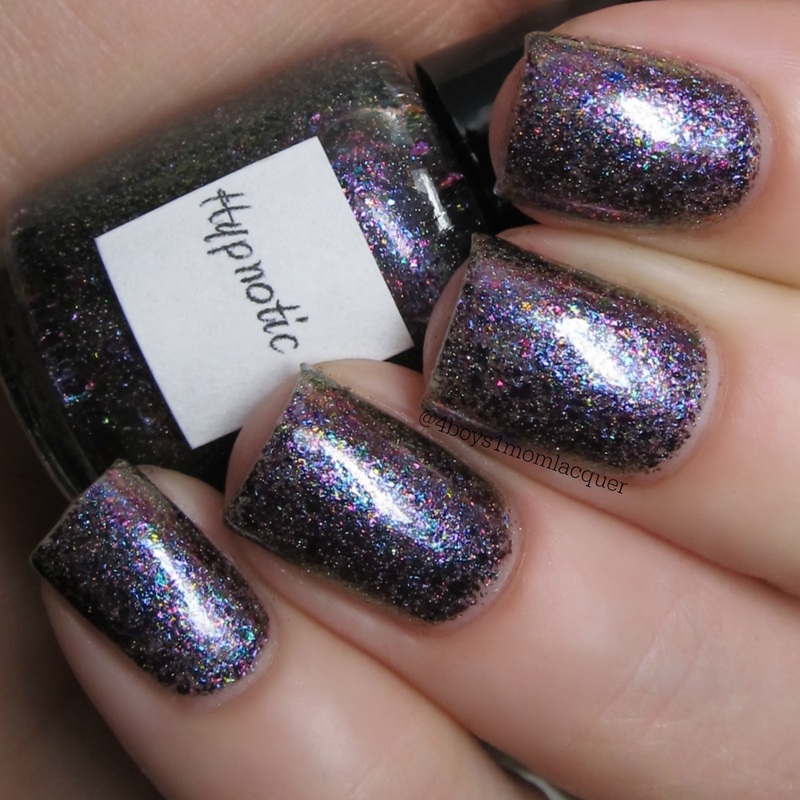 Hypnotic is described as a pink-purple-gold flaked scattered holo polish in a clear base. I applied 3 light coats followed by a quick dry top coat. This one is beautiful. I also was gifted a full size one from an amazingly sweet person. I won't name any names but she knows who she is. This applied with no issues.It's so colorful,right?! Haaked,(pronounced Hawked)is described as green-blue-gold flakes in a blue jelly base with gold hyper holo glitter. Hawked means...the flakiest of the flakes completely unreliable. I applied 2 light coats followed by a quick dry top coat. When I tried this polish on I gasped!! I could not believe how stunning it looked.This polish is one of my favorites.It applied perfectly with no issues. I have to get me a full size. Drunk Yoga is described as having a lovely violet jelly base,with green-violet shifting flakes and purple hyper holo glitter. I applied 2 easy coats followed by a quick dry top coat. This polish applied with no issues.It's truly the most beautiful shade of purple that I have seen. 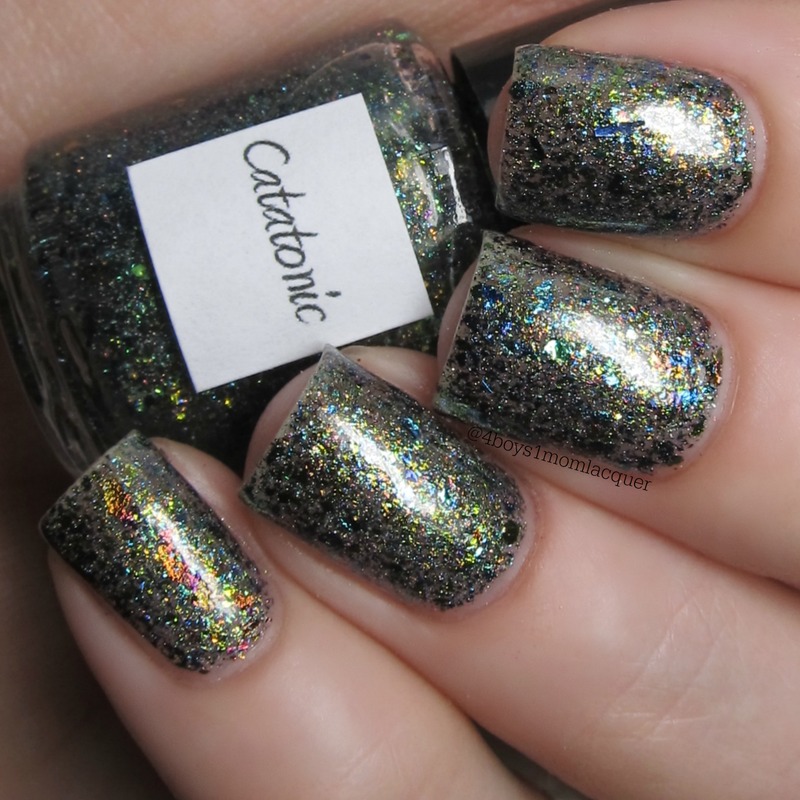 Catatonic is described as,green-blue-gold flakes with scattered holo in a clear base. I applied 3 easy coats followed by a quick dry top coat. This is another one of my absolute favorites!! It has so much shiftiness in the flakes.It's truly unique.I think this polish looks different on every nail which is so pretty.No issues to report. 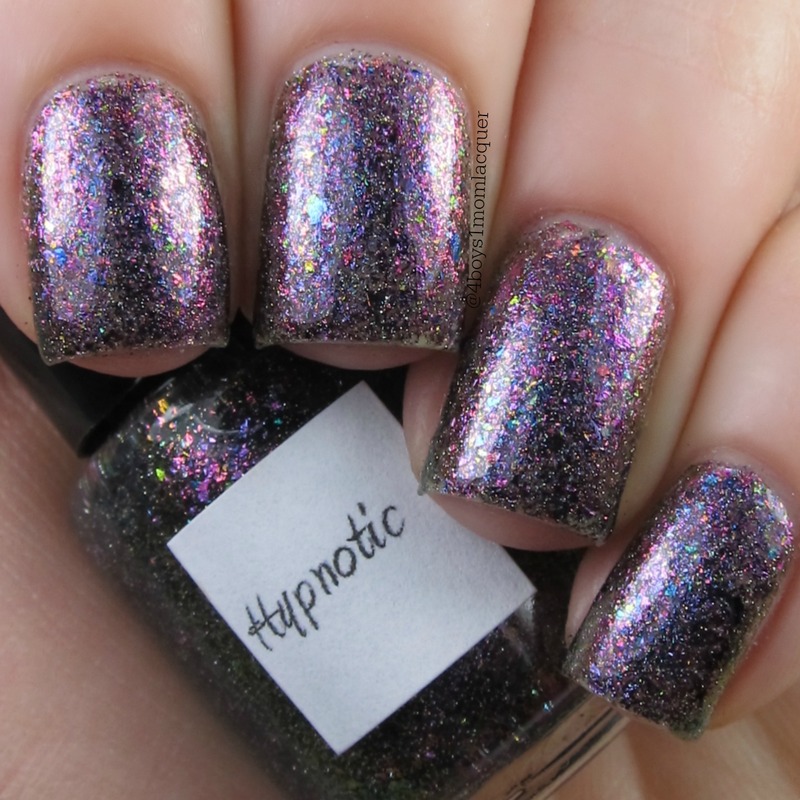 Flakey Bakey is described as pink-purple-gold flakes in a violet jelly base with purple hyper holo glitter. I totally love jellies that have flakes in them. I think it's just perfection.Jelly and flakes belong together,forever! No issues to report. 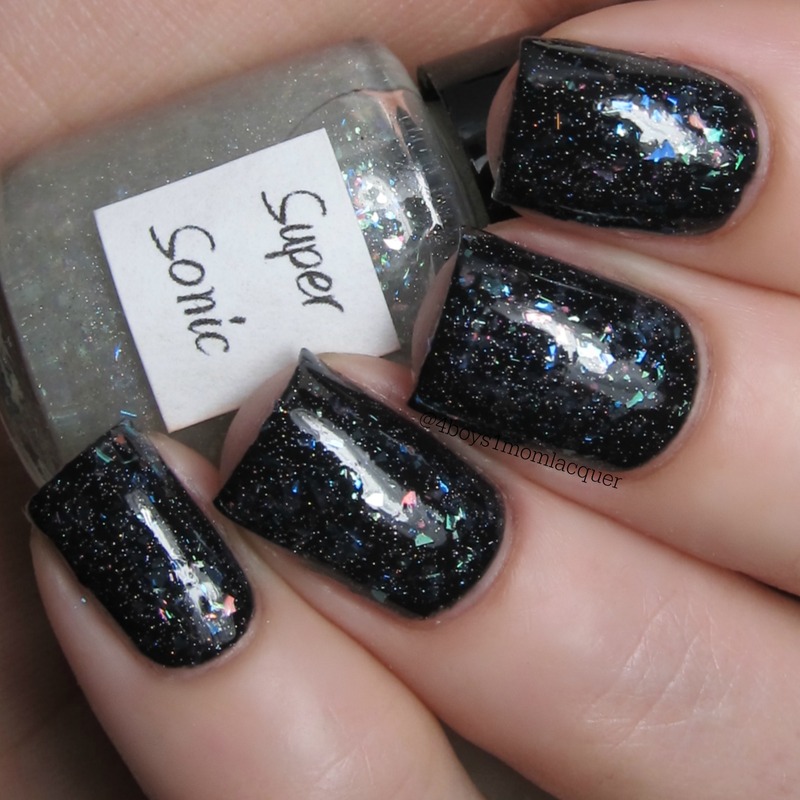 Super Sonic is described as a rainbow iridescent flake filled polish with scattered holo in a clear base. I applied 1 coat of Super Sonic over 1 coat of SinfulColors/Black on Black,followed by a quick dry top coat. The topper looks amazing over any shade of polish.I would like to see it over a water marble mani.I did not have any issues with this polish. 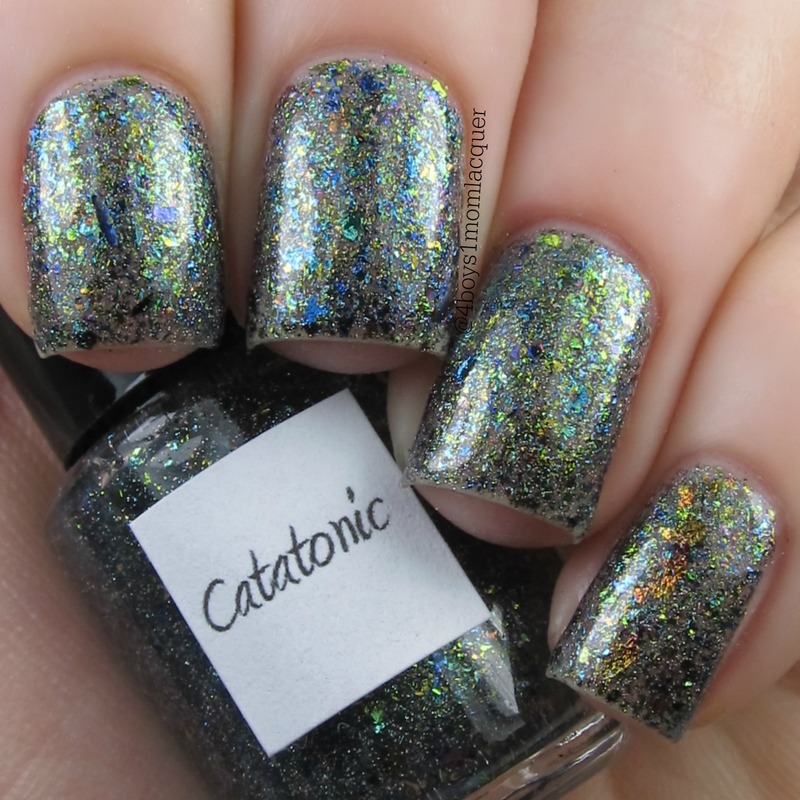 Dexter is described as a metallic base polish in a dark silvery gray with a dose of linear holographic sparkle. This polish is based on Vapid Lacquers number 1 employees and best-friend,her blue doberman,Dexter. I applied 3 coats but Dexter is a 2 coater. I applied 3 for my own crazy reasons.I also applied a quick dry top coat. It's So Sparkly!!! It is such a beautiful linear!! A photo of Dexter is even on the labels on the polish bottle. How CUTE!! I was going to do some nail art with this shade but my puppy had other plans.His tooth took off some polish before I could get creative. No issues to report. 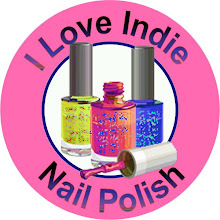 For more information on these beautiful polishes,be sure to check out all of Vapid Lacquers social media sites. 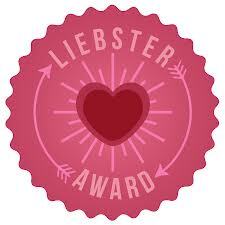 The links will be posted for you below. *Reminder* All polishes above will be releasing 1/30/2015. What are your thought on flake polishes? I love them all but Drunk Yoga is UNREAL! SO GORGEOUS!! Drunk yoga is my fave! Haaked is my FAVORITE, seriously gorgeous! No wonder you gasped! These are gorgeous! I love Haaked! OH. EM. GEE. Haaked is SO stunning!!! I'm torn between Drunk Yoga and Catatonic for my favorite from this collection. Great swatches! Ohhh my gosh! At first when I saw the collage I was like "ehh these are all really dark I won't like them," but when I saw your full pics oh my goodness! The flakies! The colour! These are so lovely!! Wow, Haaked is absolutely beautiful! I've been on the fence about the whole flakie craze but that polish is incredible! !